Have you ever wondered what it means when your physician tells you that your blood pressure is 140/90? Understanding your numbers is important. Vital signs indicate the state of your essential body functions and are a critical part of your physician’s ability to help you stay active and healthy. Blood pressure is the measurement of the pressure or force of blood against the arterial walls of your arteries. Blood pressure is written as 2 numbers, such as 120/80 millimeters of mercury (mm Hg). The top number is called the systolic pressure and measures the pressure in the arteries when the heart beats and pushes the blood out into the body. The bottom number is the diastolic pressure and measures the pressure in the arteries when the heart rests between beats. Healthy blood pressure for an adult, relaxed and at rest, is considered to be a reading less than 120/80 mm Hg and higher than 90/60 mmHg. A systolic pressure of 120- 139 or a diastolic pressure of 80- 89 is considered prehypertension and it should be monitored closely. Hypertension (high blood pressure) is considered to be a reading of 140/90 mm Hg or higher. 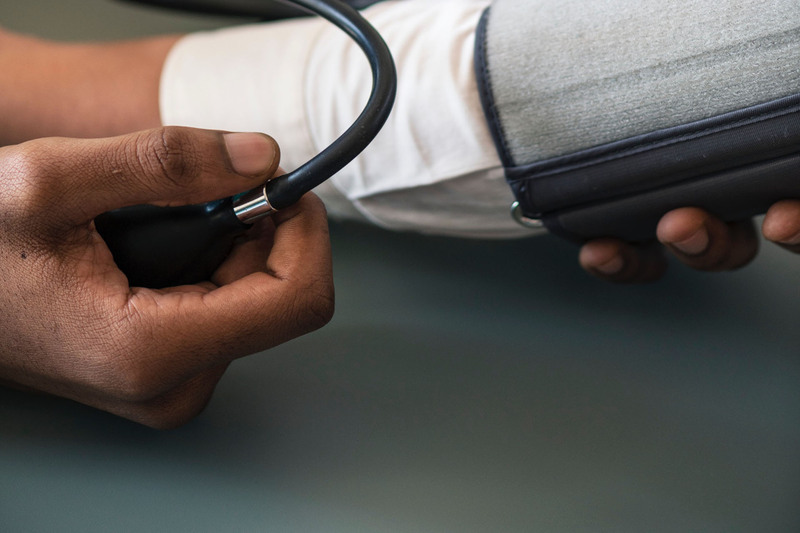 High blood pressures over an extended period of time can cause such health problems as atherosclerosis (hardening of the arteries), heart failure, and stroke. A very low blood pressure reading can also be problematic for an individual if it affects your daily functioning (ie. causes dizziness or fainting). Your primary care physician can treat both high and low blood pressure issues. When you are monitoring your blood pressure at home try to eliminate the above criteria. The best way to achieve an accurate reading is to sit quietly with both feet on the ground and your arm at heart level. Before you hit the start button on your machine, take a few minutes to relax and breathe in and out deeply releasing your muscles, especially in your arms and shoulders. It helps to place a pillow under your arm so you can relax it nicely. When having your blood pressure taken in your physician’s office, let the nurse know if any of the above criteria are present. While you are waiting for the nurse or physician to enter the exam room, sit quietly with both feet on the ground. Breathe deeply in through your nose and out through your mouth and relax your muscles. Your blood pressure should always be taken with your arm level with your heart and resting on a pillow. Blood pressure machines in pharmacies and grocery stores are not considered to give you an accurate reading. If it is high in one of these locations, check it yourself when you get home or make an appointment with your primary care provider for checkup. Healthy Lifestyle Changes will help you achieve and maintain a normal blood pressure; your stress levels will go down, patience and mood will elevate, and YOUR BODY will love you for it. Schedule a physical exam with your primary care physician to assess your vital signs and laboratory blood work. Your doctor will also assess your physical body to look for any underlying factors that may be causing your blood pressure to be high. He will also give you the education you need to make changes in your lifestyle, if necessary. MOVE more often. This doesn’t mean you have to sign up for a gym membership. Walk, Walk, Walk! Take the stairs, park farther from the doors at work or shopping, take the kids or dogs for a walk, ride your bike, join an exercise or walking group. Three times per week for 30 minutes is your minimal goal. Work up gradually to more time and/or frequency. Eat healthier. You don’t have to go all out for a strange or unappealing diet you saw on the internet. Just modify your choices and the amount of food you eat. Eating all basic 4 food groups is great, just eat more of the fruits and veggies and less of the red meats and processed sugar. Fats like olive oil and grass-fed butter in small to moderate amounts is great. Try to eat fish more often and red meat less often. Contrary to old data, fat is your friend and essential for good brain function and all of your organs. Refined carbohydrates and processed foods are NOT your friends. They wreck havoc on your weight, blood pressure, blood sugars, and many other bodily functions. Reduce stress levels whenever and wherever you can. One thing you can do at anytime and anyplace is slow deep breathing using your abdominal muscles. The process is easy and sooo beneficial. Set aside 5 minutes. Start by sitting in a chair with your feet flat on the floor. You may lie down if you wish. Inhale to the count of 4-5 seconds, through your nose. On inhale, fill your lungs with a fresh breath (outdoors if you can) and let your abdomen rise or “pooch out”. Follow the inhale with an immediate exhale through your mouth to the count of 6-8 seconds, letting your abdominal muscles release and trying to push out all of the air. Don’t force either the inhale or the exhale if it creates more tension. It’s OK to use fewer seconds. As you inhale, you draw the tension, in your muscles, to the breath and upon exhale, you breathe out all tension. Most of the tension we carry around all day is located in our face (especially behind our eyes), neck, shoulders and chest. While breathing, imagine your “happy place”. It could be laying on a white sand beach on your favorite island or snuggled up in a warm cozy cabin in the mountains with a brilliant fire crackling beside you. Listen to the sounds, smell the scents in the air, and feel the comfort of that place. When your exhale is a few counts longer than your inhale, the Vagus nerve (running from the neck down to the diaphragm) sends a signal to your brain to turn up your parasympathetic nervous system and turn down your sympathetic nervous system. The sympathetic nervous system is your fight or flight response and when those nerves fire, your heart rate and breathing speed up. Stress hormones, like Cortisol start pumping through the bloodstream, preparing your body to face a threat. If the threat is physical, like running from a lion, your body will use these stress hormones to make you faster and stronger to deal with the situation. However, if the threat or stress is caused by your boss yelling at you and you are not able to move, run, and burn off these hormones, the stress hormones and chemicals released from the sympathetic system stay elevated for too long and cause damage to your body. Your parasympathetic, on the other hand, controls your rest, relax, and digest response. When this system is activated, your breathing and heart rate slow, your blood vessels relax, and your blood pressure lowers. Vital signs indicate the state of your essential body functions and are a critical part of your physician’s ability to help you stay active and healthy.